My friend Jenn came to visit this weekend. Jenn and I met at work 15 or 16 years ago, but most of the time we’ve been friends, she’s lived out of state, if not out of the country. For the last six years, she’s been teaching overseas and doing lots of traveling, so I see her rarely. Jenn’s a theatre buff like me; in fact, when I visited her in New York City in 2001, we saw six live shows in a week! Because I had to work part of the time Jenn was here, I wanted to do at least one really fun activity, so we decided to drive up to San Francisco to see Old Hats. Neither of us was sure what to expect, but we’ve both seen great shows at ACT over the years, and San Francisco is the hometown of my heart. I was born there and lived there when I first moved out on my own, so even though I wasn’t raised there, it’s a special city to me. As it turned out, the time we spent sitting in that gorgeous old theatre (I wanted to take some pics, but the usher in our section made it very clear that it was not allowed) was the happiest I’ve felt in years. The performances were so thoughtful and touching that I was near tears for much of the show…but the kind of tears that come because you are so moved that you have to let it out. 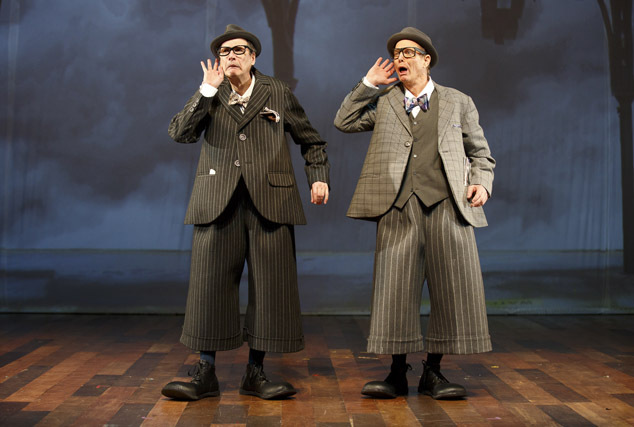 Bill Irwin is probably the most well-known modern clown in the US. I was lucky enough to see him acting in Waiting for Godot at the ACT 10+ years ago. His partner for Old Hats, David Shiner, is known for being part of Cirque du Soleil, as well as for performing in another piece with Bill Irwin, Fool Moon. Accompanied by Shaina Taub and her band (who also performed songs in between the clown sketches), Irwin and Shiner explored technology and social media, politics, silent film, magic acts, loneliness, and sheer joy…without speaking a word. If you live anywhere near San Francisco, I highly recommend seeing this show. It’s suitable for all ages and is wipe-your-eyes funny and totally sweet.